For other uses, see bow shock (aerodynamics). The locations of Voyagers 1 and 2 as of 2005. The "bow shock" shown is the shock caused by the sun as it moves through the interstellar medium; the Earth is too small to be seen on this scale. Note that the intensity of this shock is greatly exaggerated. A bow shock is a boundary between a magnetosphere and an ambient medium. For stars, this is typically the boundary between their stellar wind and the interstellar medium. In a planetary magnetosphere, the bow shock is the boundary at which the speed of the solar wind abruptly drops as a result of its approach to the magnetopause. The best-studied example of a bow shock is that occurring where the solar wind encounters the Earth's magnetopause, although bow shocks occur around all magnetized planets. The Earth's bow shock is about 100-1000 km thick and located about 90,000 km (55,923 miles) from the Earth. where cs is the speed of sound, $ \gamma $ is the ratio of specific heats, p is the pressure, and $ \rho $ is the density of the plasma. The particles making up the solar wind follow spiral paths along magnetic field lines. The velocity of each particle as it gyrates around a field line can be treated similarly to a thermal velocity in an ordinary gas, and in an ordinary gas, the mean thermal velocity is roughly the speed of sound. At the bow shock, the bulk forward velocity of the wind (which can be seen as the velocity of the points on the field lines about which the particles gyrate) drops below the speed at which the particles are corkscrewing. It is hypothesised that the Sun also has a bow shock as it travels through the interstellar medium, as shown in the figure. This will occur if the interstellar medium is moving supersonically towards the Sun, since the sun's solar wind is moving supersonically away from the Sun. The point where the interstellar medium becomes subsonic is the bow shock; the point where the interstellar medium and solar wind pressures balance is at the heliopause; the point where the solar wind becomes subsonic is the termination shock. According to Robert Nemiroff and Jerry Bonnell of NASA, the solar bow shock may lie at around 230 AU from the Sun. Bow shocks are also a common feature in Herbig Haro objects, in which a much stronger collimated outflow of gas and dust from the star interacts with the interstellar medium, producing bright bow shocks that are visible at optical wavelengths. The following images show further evidence of bowshock existence from dense gases and plasma in the Orion Nebula. 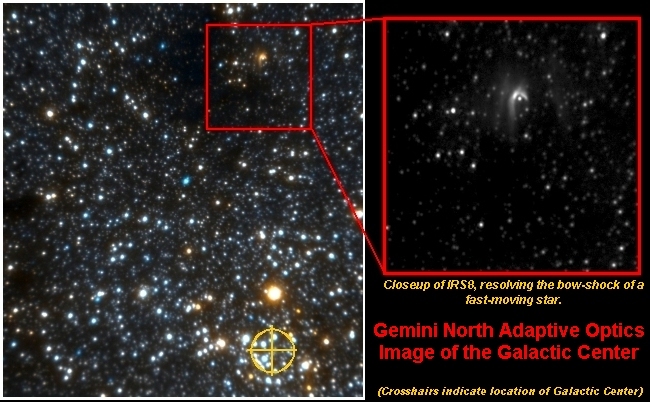 In 2006, a far infrared bow shock has been detected near the AGB star R Hydrae.